Inside: Discover how to make the best 20 fresh basil recipes, perfect for when you’re wondering what to make with basil. On the menu of recipes with fresh basil are some mouth-watering dishes like Garden Fresh Bruschetta, Spicy Basil Lemon Chicken, Basil, Tomato, & Feta, Pan fried Cod in a Citrus and Basil Butter Sauce, Simple Honey Basil Fruit Salad and so much more! I love cooking, especially with fresh basil. It’s a great plant to grow at home because it is low maintenance. Around August and September, I usually have a surplus of fresh basil that I don’t want to go to waste. What to make with fresh basil? Once you harvest your basil, you are ready to roll. 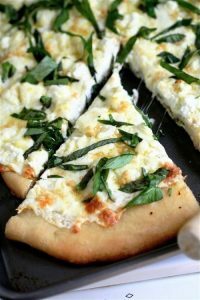 First, I am going to share my favorite recipe using fresh basil, then you can scroll to see the rest of the top 20 basil recipes. At the bottom, you can find the printable recipe for the 3-Step Caprese Salad with fresh basil. 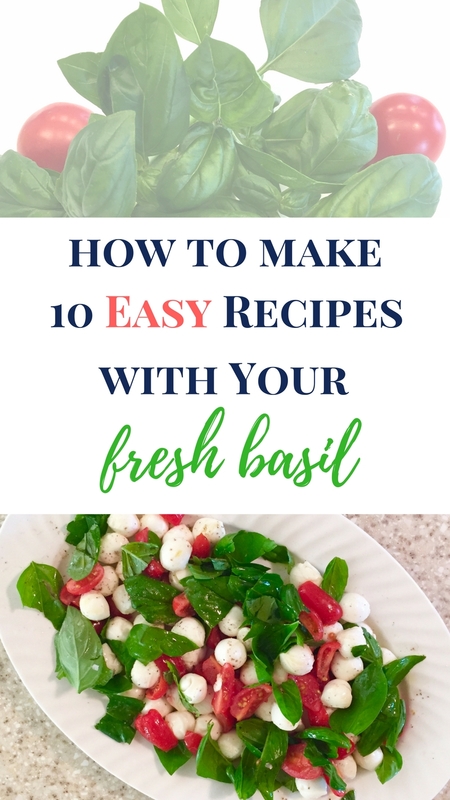 This is my favorite easy fresh basil recipe because it is so simple and you can really taste the robust flavor of the basil. In just minutes, you can combine mozzarella, sliced tomatoes, chopped basil and olive oil. Mix it together, sprinkle with salt and pepper and devour. 2. Rinse and chop basil. 3. Combine mozzarella, tomatoes, basil, and olive. Sprinkle with salt and pepper to taste. 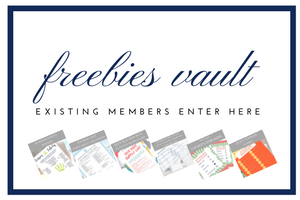 Be sure to scroll to the bottom to view the easily printable recipe card. Enjoy! Here are more easy fresh basil recipes that are super yummy. Turkey Bacon and Avocado Grilled Cheese sandwich loaded with fresh basil, tomatoes and mozzarella cheese on a hearty artisan bread. 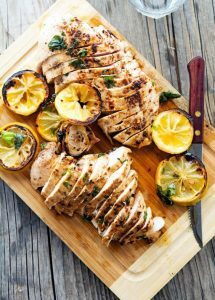 Spicy Basil Lemon Chicken made with chicken, lemon, basil, garlic and spices. Super simple and delicious dressing that compliments any salad!! 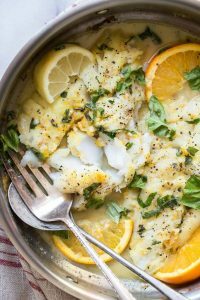 An easy and tasty spring time meal of pan fried cod in a light citrus butter sauce and fresh basil. This is a healthy and delicious dinner option! Homemade Basil Pesto – A simple recipe for traditional basil pesto with a secret ingredient that makes it so delicious! 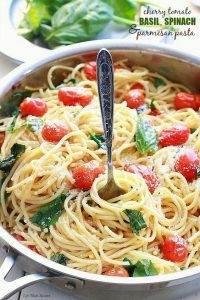 Cherry Tomato, Basil, Spinach and Parmesan Pasta – An easy and delicious meatless weeknight meal that comes together in as little as 20 minutes with fresh basil, cherry tomatoes, baby spinach, parmesan and pasta. 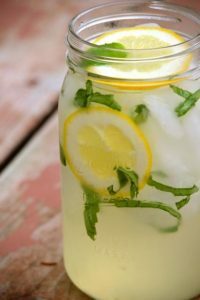 Basil Lemonade with simple syrup, freshly squeezed lemon juice, cold water, fresh basil leaves, and lemon slices. Fresh Basil Garlic Bread is quick & easy to make, covered in fresh flavor, & a bright beautiful addition to any Italian meal! This recipe makes a tasty loaf filled with fresh basil, tomatoes, garlic, and shredded cheese; the bread has wonderful soft texture, and is packed with flavor. This healthy, sweet and tangy strawberry salsa recipe is nature showing off in all its splendor through perfect flavors and textures. An easy yet fancy looking holiday recipe that’s perfect for breakfast, brunch or lunch! Filled with melted mozzarella, fresh basil, garlic infused spinach and roasted tomato – it’s pretty much divine! We’re in love with this easy zucchini pasta recipe. There’s fresh zucchini, tomatoes, basil, parmesan, and lots of garlic. Plus, it only takes 20 minutes to make. Blackberry Basil Moscow Mules. If you’re a Moscow Mule fan, you’re going to love this vibrant, simple spin on the popular cocktail with fresh blackberries and basil! This fresh tomato soup is kicked up a notch with fresh basil and feta cheese and dairy free! Easy to make and delicious!! This Chickpea Cucumber Feta Salad has ALL the best flavors! Loaded with chickpeas, cucumbers, red onions, feta cheese, and fresh basil….this salad is so easy to make and is the perfect side dish for any meal! 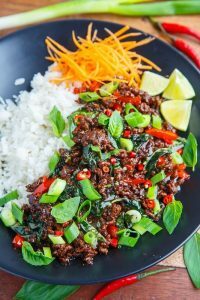 A quick, easy and tasty Thai style beef with plenty of fresh basil! So are you a pro at cooking with basil now? I hope so! I love experimenting with new recipes like this red velvet cake pops recipe or this yummy stuffed shells recipe. Come back to visit so we can cook some new recipes together! 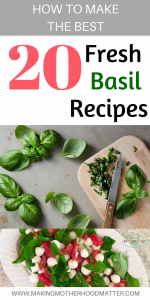 Whether you buy your fresh basil from the grocery store or harvest it from your own garden, I will share with you how to make the best 20 fresh basil recipes. P.S. If you enjoyed this recipe, you may also like Perfectly Tender BBQ Ribs Recipe That Will Rock Your World. Not only is my recipe for perfectly tender ribs easy, it’s also reliable so you will cook tender, finger-licking ribs every time. Discover my tender BBQ ribs recipe secrets, cooking process, and my favorite cooking tools. 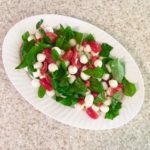 Fresh Basil Caprese Salad is my favorite easy recipe because it is so simple and you can really taste the robust flavor of the basil. Combine mozzarella, tomatoes, basil, and olive. Sprinkle with salt and pepper to taste. This content is really cool. I have bookmarked it. Do you allow guest post on your blog ? I can write hi quality posts for you. Let me know.